Kashima Antlers booked their place in the FIFA Club World Cup semi-finals after defeating Mamelodi Sundowns 2-0 at the Suita City Football Stadium in Osaka. Second-half strikes from Yasushi Endo and Mu Kanazaki set up a last-four meeting for the J.League champions with 2016 Copa Libertadores winners Atletico Nacional. The host club’s fans, decked in red and black and equipped with giant flags, created plenty of noise throughout the encounter, while a pocket of buoyant travelling Sundowns fans were also keen to make themselves heard. In the first half, Sundowns looked like they would be causing Kashima problems with their blistering pace. Khama Billiat got the better of Gen Shoji on seven minutes before cutting inside the box and playing in striker Leonardo Castro, but the Colombian was unable to make a clean connection. Billiat went close again moments later for the CAF Champions League winners, forcing Hitoshi Sogahata to make a stretching save after another surging run, before Percy Tau relentlessly charged through the middle of the park and forced Sogahata ​to make a strong one-handed stop. 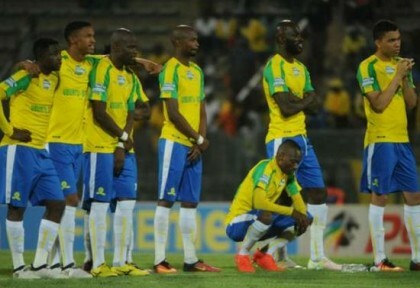 Sundowns – also known as Masandawana – continued to looked the dominant side in attack throughout the first half and, after some nice link-up play, Samuel Mabunda launched a powerful effort from outside the area that looked destined for the top corner, but Sogahata was quick to react again. After a rather subdued performance in the first half, Kashima started to come to life after the break, with an Endo header from the centre of the area being scrambled away by defender Ricardo Nascimento. Endo went close again soon after, but saw his strike hit the top of the netting moments later. Shoma Doi received the ball in the centre of the area on 56 minutes and while he turned and got his shot off towards goal, his effort was headed away by Tebogo Langerman. There was more danger in the Sundowns box moments later when Daigo Nishi’s downward header looked destined for goal but Wayne Arendse valiantly headed the ball off the line. The J.League side continued to put the South African side under pressure and their persistence paid off on 63 minutes. A Shuhei Akasaki cross from the right found Doi inside the area, who headed the ball downwards for Endo to convert a low strike past Denis Onyango. The shot-stopper looked to have had a touch of the ball before fumbling it into the net. On 69 minutes, Kashima captain Ryota Nagaki saw a thunderous strike from range tipped away by Ugandan goalkeeper Onyango. But Kashima sealed the deal on 88 minutes, with substitute Yuma Suzuki cutting the ball back to Mu Kanazaki, who slotted the ball home to set up a meeting a against South American kings Atletico Nacional in Osaka on Wednesday.